Approximately three months ago, Somalia's Transitional Federal Government, pressured out Prime Minister Ali Mohamed Gedi. Surprisingly, this political rearrangement of deckchairs generated many noisy headlines. Meanwhile, the real story—the great unfolding humanitarian disaster—continued unnoticed. For the Somali people, the Ethiopian invasion of December 2006 could not have started at a worse time. Defeating the Union of Islamic Courts and propping up the Transitional Federal Government was Ethiopia's immediate rationale for invading Somalia. The larger goal was to forge a partnership between Washington and Addis Ababa in order to execute the "war on terror." A year later, this mission has not been accomplished. 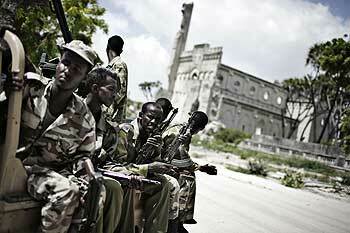 Instead, the war on terror has become the terror of war being visited on the Somali people. Admittedly, a handful of Somalis have benefited from the invasion, specifically the dozens of warlords previously driven out of Mogadishu by the Union of Islamic Courts. These warlords, the instigators of Somalia's current civil conflict, were reinstalled in their fiefdoms riding on the backs of Ethiopia's invading tanks. As a result, the reviled checkpoints and roadblocks used to bully cash out of unarmed civilians were reintroduced in southern Somalia, particularly Mogadishu. To keep the invasion and Africa's worst humanitarian catastrophe going, heavy and modern weapons, including airplanes were used. One was a United States Air Force AC-130 gunship that attacked and killed Somali villagers and countless livestock in the hunt for three foreign men suspected for the 1998 bombing of American embassies in Africa, who yet remain at large. Among those caught in the chaos were visiting Somalis from the diaspora. In the period between June and December 2006, Somali technocrats returned to their native country to partake in the rebuilding in the six-month period of peace and stability that was established under the rule of the Union of Islamic Courts. The diaspora arrived with the intention to give back to the land and the people they left behind and contribute to rebuilding their lives. Unfortunately, extraordinary rendition programs were the gratitude they received; in that, the Transitional Federal Government, Kenya, Ethiopia, and the United States can all be implicated. Young men as young as 12 years of age were taken out of their homes in the dead of the night, blindfolded, and carried off to unknown destinations. Fleeing refugees of mostly women and children met a similar fate. Unfortunately, these refugees had nowhere to escape to, as Kenya decided to close its borders and deny them entry. This paved the way to the current nightmare scenario: 1 million internally displaced persons, mostly children and women, without any provision or protection from the United Nations or other humanitarian agencies or nongovernmental organizations. In order to create a safe haven for the displaced refugees, the international community must demand that neighboring countries open their borders. It is all too often that the casualties of war are those that go unmentioned. The innocent men, women, and children, caught in the middle, left with no way out. The United Nations High Commissioner for Refugees, António Guterres, said border security measures should not impair the ability of deserving Somali civilians to enter Kenya to seek safety and protection as refugees. The neighboring nations have a humanitarian responsibility to safeguard these refugees. On Oct. 30, 40 international N.G.O. 's released a joint statement ominously warning against a gathering cloud of humanitarian catastrophe in Somalia and urging the international community to respond to this man-made calamity as the Ethiopian forces and militias loyal to the Transitional Federal Government callously prevent the delivery of assistance, and bluntly stating that "there is an unfolding humanitarian catastrophe in south central Somalia." Meanwhile, Ethiopian forces continue their shelling of Mogadishu neighborhoods, having killed, according to the Elman Human Rights group, 7,000 civilians, mostly women, children, and the elderly, between January and November of 2007. "In 'Shell-Shocked,' Human Rights Watch's August 2007 report of our investigation of the March-April hostilities, we documented many of the most serious patterns of abuse by Ethiopian troops, such as indiscriminate attacks on civilians, summary executions, and repeated targeting of hospitals," wrote Tom Malinowski, Washington advocacy director for Human Rights Watch, in an open letter to Secretary of Defense Robert Gates. Somali caricaturist Amin Amir (www.aminarts.com) depicts this moral selectivity in his Dec. 12 cartoon. The powerful imagery shows a representative of the international media zooming his camera in on a severely malnourished child standing in the middle of a killing field where many bodies are on the ground and Ethiopian fighter jets are flying overhead and dropping missiles. The child retorts: "I don't need your coverage; it is these atrocities"—pointing to the dead—"that you need to be telling the world." The current Somali nightmare was exacerbated by the systematic assassination of Somali independent media groups who are not pro Transitional Federal Government and the Ethiopian occupation. And the silence of the international community on this matter is deeply disturbing and sadly deafening. This year alone, eight Somali journalists were killed—their crimes being to have simply dared to report on the reality on the ground in Mogadishu. The Transitional Federal Government and Ethiopian forces are terrorizing Somali reporters creating an uncomfortable environment of terror and coercion. According to the United Nations Children's Fund, one-quarter of the refugees around Afgooye are younger than the age of 5. Sick children and pregnant women often are turned away at checkpoints, and trucks carrying food and other humanitarian aid are routinely charged $500 each to pass through. Sadia Ali Aden is a mother, writer, and voice for justice and equality.